Last year I bought a kit of gym clothes, a bag and a towel for Isabel at our local supermarket. It was great to buy it as a kit and it was very affordable. Unfortunately more parents had the same idea and at the start of term pretty much every little girl in Isabel's class sported a purple nylon drawstring bag with the same print on it and the same purple gym clothes and the same pink towel. It didn't take long before Isabel cam home with the wrong size gym clothes after school one day. We quickly figured out whose clothes we had gotten and I washed them and returned them with in a few days. But no matter how many times we asked for Isabel's clothes back they took their time returning them, and when they finally did, we got the wrong size back! So in the end I sewed up a quick pair of pants and a shirt for her to wear. She never really like them - thought they were too warm but it worked. So at the end of spring term, one of the last days of gym I had forgotten to wash her towel and I reluctantly lent her one of my own. It was an old towel - almost as old as me and I loved it to bits. The fact that it's still in one piece tells of the great quality of it. Well - you can guess, Isabel forgot she had it and just took the generic purple towel she was used to have with her at the end of class and my favourite towel was lost. This term I'm not making the same mistake. 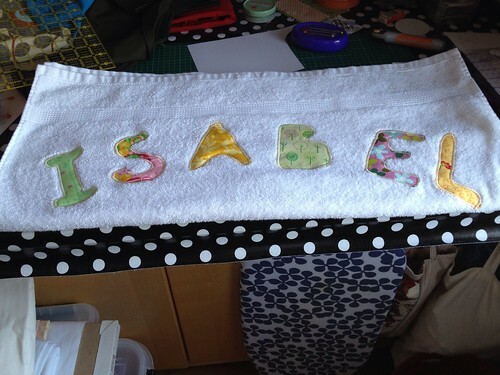 I bought a white towel at the store and appliquéd Isabel's name to it. Even if someone accidentally brings it home with them their parents will see who it belongs to easily enough and hopefully return it. At least one can hope. I also sewed up two kitchen towels into a tote bag for her to use as a gym bag. Ain't no one gonna have the same so she can't accidentally bring the wrong one home. Now - to fix some new gym clothes that aren't as warm ... wish me luck. I'm also going to send an e-mail to the parents' list to ask if my towel has surfaced somewhere. It feels silly to go to such lengths about a silly 35 year old towel, but I really liked it.